In the 2010s New Zealand’s women’s hockey team was consistently among the best in the world. At the end of 2017, for example, it was ranked fourth, above heavy hitters Australia and Germany. In 2011 New Zealand finished third at the Champions Trophy, an event contested annually by the world’s top-ranked teams. They defeated South Korea in the play-off for third place after Charlotte Harrison scored in extra time. 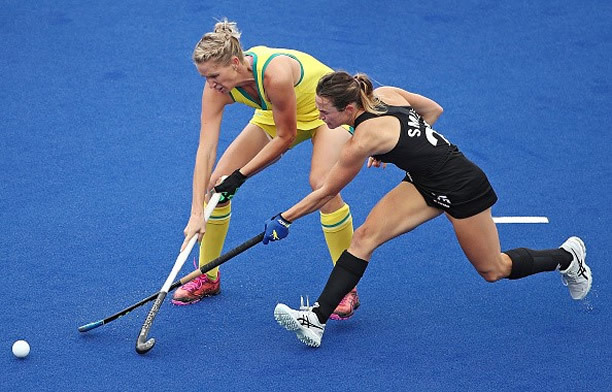 At the Gold Coast Hockey Centre in 2018, New Zealand came second in its Commonwealth Games pool, with big wins over Scotland and Ghana and scoreless draws with Canada and Australia. A scoreless draw with England in the semi-final was followed by a penalty shoot-out. The Kiwis got that monkey off their backs by outscoring England 2–1 thanks to superb goalkeeping by Grace O’Hanlon, then dominated Australia in the final to win 4–1. We have 15 biographies, 9 articles, related to Black Sticks Women win Commonwealth gold.